This year, I have been blessed with 4 Royal Wedding Cakes for the same family. The State of Pahang is massive, and with that, so is their extended family! I grew up with several princes and princesses from various states, in my primary and secondary school days. It’s such a small world! 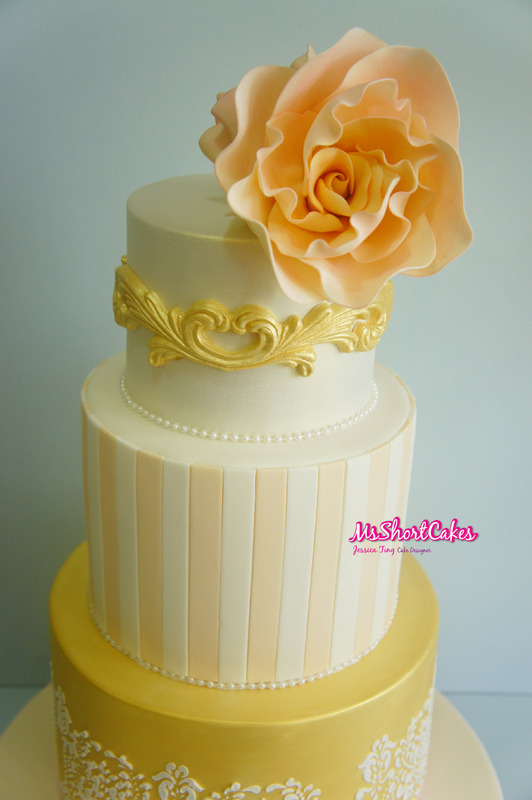 As many of you already know, the first 2 Royal wedding cakes I did, were in January this year. 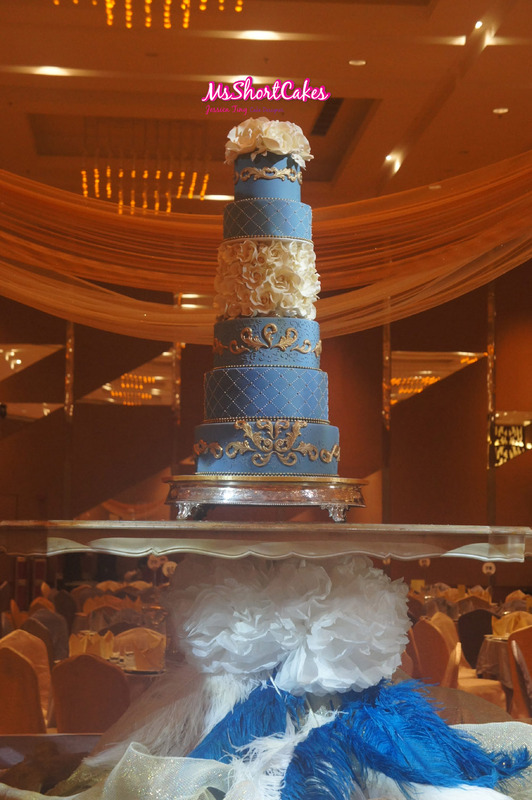 2 couples were getting married on the same day, and I had the daunting task of creating 2 huge wedding cakes for at the same time, plus 30 mini wedding cakes for the VIP table as well. It’s the month of August 2013 now, and one of my best friends, A, who is related to the Pahang Royal Family got married as well. It was an intimate wedding held over a course of 3 separate celebrations. For 2 of the occasions, there had to be cake. Of course, the cakes came from myself, and these are what I came up with. I was given free reign of the designs (Yay! ), BUT, under no circumstances were there to be any white flowers or black. Damn! I was SO close to putting a little touch of black on the wedding cake. Oh well, it still turned out beautiful though, and had a soft, vintage feel to them. I was very pleased with the cakes!! And with A’s wedding out of the way, that was the last day I would have a night off for a long, long time. The moment her wedding was over, it was crunch time. 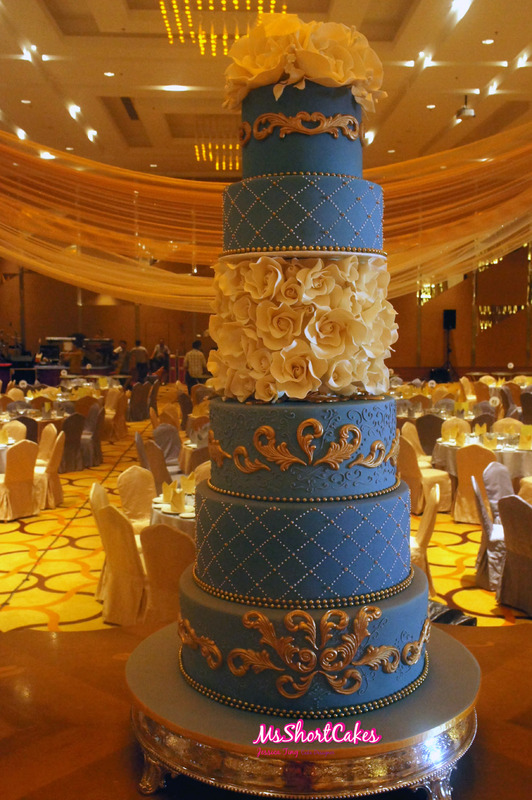 I had a huge 6 tier, the following weekend in Kuantan. I spent the entire week prepping for the trip and to make sure all elements of the cake were flawless. All the tiers were boxed and my Dad did a stellar job, custom making my boxes to the precise heights and widths that I needed. The hardest part of the job, in my opinion, is the delivery. Everything may look great when it’s done, but when you need to drive a fragile item in varied traffic and weather conditions, through a hurdle of obstacles, wrong turns and bends….the cake can get damaged. So, the day finally came to transport all my cakes, equipment, luggage, and myself to Kuantan. The driver was prompt and ready for the daunting task of driving us to Kuantan, without any damage. He was pretty good, taking it easy and of course, he was very familiar with the route. So every bump and uneven surface along the way, he could anticipate. I was very impressed. Meanwhile, a few drivers from his clan were racing up the highway, enroute to the Royal Wedding. It was quite funny as he was really embarrassed to be driving that slow! We arrived 3 hours later, which wasn’t bad at all. The staff at the Zenith Hotel welcomed me back, and it was great to see all the familiar faces once again. My work space was ready in one of the conference rooms, upon request. And then it was time to unload! This was where I was most anxious. I prayed that there would be no severe damage. But I was quite confident that I packed the cakes up well, and they weren’t moving in the boxes at all! 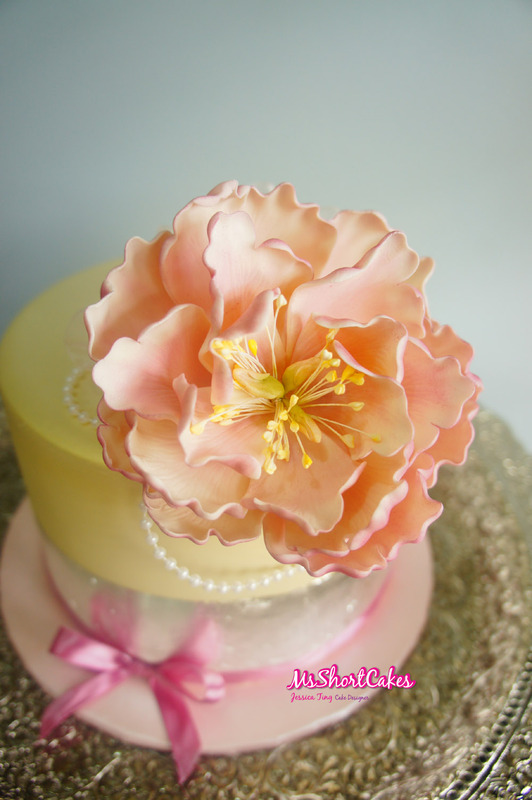 All the effort paid off, and there was not a single petal broken from my sugar roses, nor any major damage to the cakes. The two largest tiers had a little icing droop down the bottom, but nothing I couldn’t fix. I was very, very relieved. Meanwhile, travelling behind us were 10 other fondant cakes, from a different supplier. These cakes ended up in my conference room as well, and the driver had kindly asked me to have a look at them. When I settled in and had a moment, I opened the boxes up one by one. Out of the 10 cakes, 4 were damaged. Roses were falling off, a few butterflies had broken, petals had broken, mini blossoms were loose….it wasn’t a pretty sight. So. What do I do? I fix them. These cakes were gifts to the various Sultans from each state. I had to do something. I picked up my piping bag and filled it up with royal icing, and get to work. These cakes were poorly put together and even when I picked up the decorations, they weren’t even stuck on the cake properly! No wonder during the delivery, the decorations fell off. The delivery is the most important part of the cake, I think. You can make a hell of a cake spend days on it, but once you put it in a moving vehicle for 40 minutes or 2 hours, and it starts to fall apart….all that work means nothing anymore. So to all the cake decorators out there, do take note. Make sure all your bits and bobs are firmly attached to the cake, and nothing is moving. Stacked cakes shouldn’t have any movement on them, whatsoever. I was up quite late the following day, and began my day at 11 a.m. I was raring to go! I also decided to document the assembly of the cake, just for the heck of it. And will upload that at the end of this post. I really hope I get to do more cakes like this in the future. It’s such a beautiful sight when it’s all put together and complete. And the sense of achievement I get, is exhilarating! 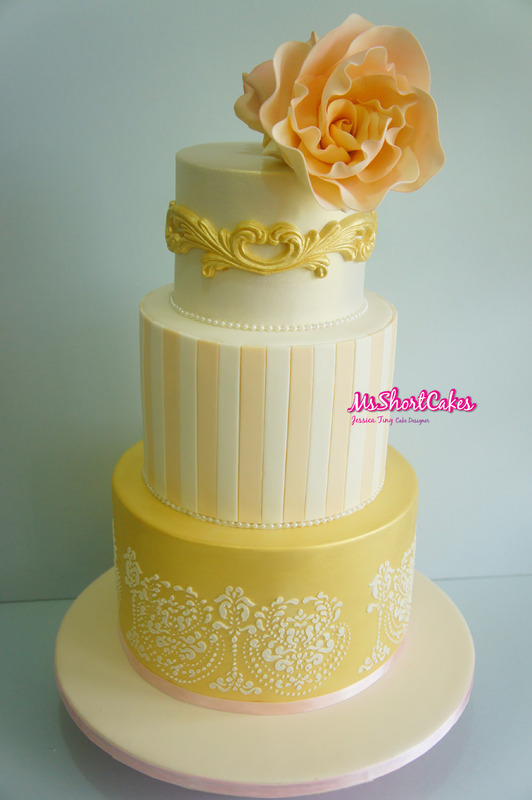 And here’s the AMATEUR video of the making of the Royal Byzantine wedding cake video. It’s a 3 part series, but for this blog post, I will upload the final part. 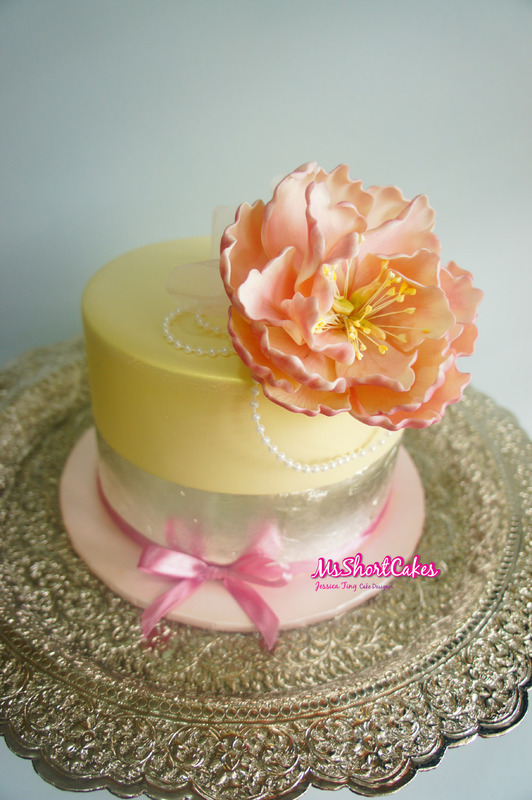 The first 2 videos can be found on my Facebook page Miss Shortcakes .